Largest municipality in the Netherlands opens doors to public; 89 place names in copper shutters adorn entrance of local government offices in Sneek. The contemporary glass façade alludes to the old buildings across the street in a modern way. The ground floor was given copper shutters in which the names of all 89 villages and cities were written as cutaways. After opening hours of the building, when the shutters are closed, the names are illuminated from behind. It is the display window of the largest municipality in the Netherlands. When the shutters are invitingly opened, the meeting centre is a shop one can enter. 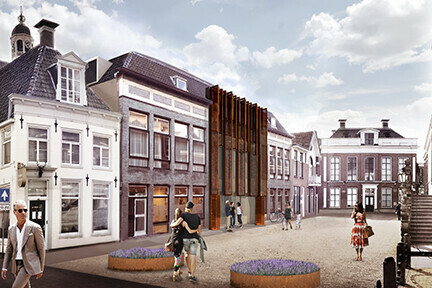 After joining 89 cores in the new Súdwest Fryslân municipality, Sneek was appointed as the location for the new joint local government offices. A challenging choice, as the current local government offices in “Snits” (its Frisian name) is spread over 22 smaller buildings, most of which are monumental, with the City Hall dating from 1550 as the central building. People wanted to maintain the cultural value of the old city centre. In order to make space for nearly 700 officials, the public part of the municipality was moved across the street to a former bank building from the 1950s. This became the new location of the main desk and the council meeting room, with the offices of the officials situated on the higher stories. All aspects include hospitality, clarity and openness: befitting a modern municipality. This includes the public spaces. Furniture and spaces were designed in a way to create a diversity of places. This variety ensures that each type of service has a fitting form, thus guaranteeing the safety and privacy of both citizens and staff. The interior is ageless, and its colours, like green and gold, were inspired by the many style rooms in the historical buildings. All this, combined with the typical Frisian depictions of the skûtsjes (small sailing boats) and naming of the consulting rooms, named after the types of boats, created a recognisable Frisian interior. A selection of the municipality’s historical and art collections is exhibited in the meeting centre in decorative fashion. Inbo contributes to both the building’s renovation and its interior, which it does together with construction company Dijkstra Draisma. The project consists of several building parts, of which the first part of the renovation was finished in December. The renovation of the back office across the street has already started. The offices are to be ready for use by the third quarter of 2019.